I love reading poetry. There's something so beautiful about the memories and emotions that are captured. I recently read "Poetry and Ponderings" by Diamante Lavendar, and while the memories and emotions were extremely difficult, they were still expressed so beautifully. In this rare collection of nonfiction Christian poetry and prose based on real life experiences, Diamante Lavendar, a victim of abuse, shows the reader the raw emotions of pain, hate, and denial that occur before a victim of abuse can find a way to heal from the pains of assault. Knowing herself the very difficult journey of being a victim, Diamante was abused as a child, and turned to alcohol and drugs to numb the pain. Many years later, she started to heal under God’s watchful eyes and was able to find love in her life again. She shares these truly inspiring, religious poems in the hopes that it may help other victims heal their hurts, as she did while writing the poetry collection." "Diamante Lavendar has been in love with reading since she was a child. Diamante believes that everyone should try to leave their own positive mark on the world, and to make it a better place for all. Writing is her way of leaving her mark—one story at a time. She began writing in college and has published poetry in anthologies over the years. Most of her writing is very personal and stems from her own experiences, and those of her family and friends. She writes to encourage hope and possibility to those who read her stories. 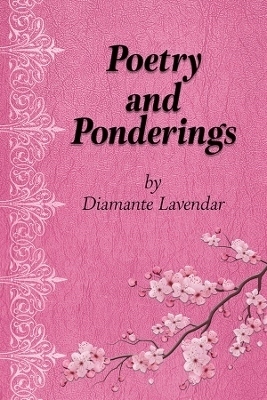 To learn more about Diamante Lavendar and her books, please visit her website at: www.diamantelavendar.com." I can absolutely relate to writing poetry to help process emotions and past experiences that have gutted you. Pouring your heart out into a poem is like holding your beating heart in your hand - you're exposed, uncomfortable, but ultimately, you're examining what's inside. And it does help with healing. In "Poetry and Ponderings", it feels like Lavendar is opening up the pages of her journal for us to see. It's very personal, and in the beginning, her invisible wounds are clearly depicted. And then as the book goes on, you can see the wheels of healing begin to turn. Lavendar takes a lot of comfort in her faith and in the love of her family - and shining through it all is a message of hope. That you can go through something that shatters you and make it through to the other side. I would not know how to live. I would not know how to give. I would have no compassion. I would have no expression. I really enjoyed reading this book and I've gone back and re-read it a couple of times. I think my only criticism was the "Enlightened Affirmations" at the beginning of every chapter. I would have preferred to let the poetry speak for itself. But it doesn't take away from the poems at all, and overall I thought it was a great collection. I admire Lavendar's courage in speaking up about her abuse. Breaking the silence is the only way to break the stigma surrounding sexual abuse and allow victims to become empowered instead of shamed.